Soldiers weld on the border fence near Nogales, Ariz. Arms welded to the wall hold rolls of concertina wire. Border fence with razor wire near Kino Springs at the Santa Cruz on Feb. 5, 2019. Bails of razor wire on Feb. 5, 2019 in Nogales, Ariz., awaiting installation on the U.S.-Mexico border fence. Art Abarca and Jennie Flores live near the border wall on Dunbar Drive. The new layers of concertina wire are “too much” and “ridiculous,” they say. Rolls of razor wire reach the ground on the border wall. Some areas have a restraining fence and warning signs, but others, like this one, do not. U.S-Mexico border fence just east of downtown Nogales, Ariz., on Feb. 5, 2019. The residents of West International Street witnessed Tuesday the result of our federally mandated border panic. 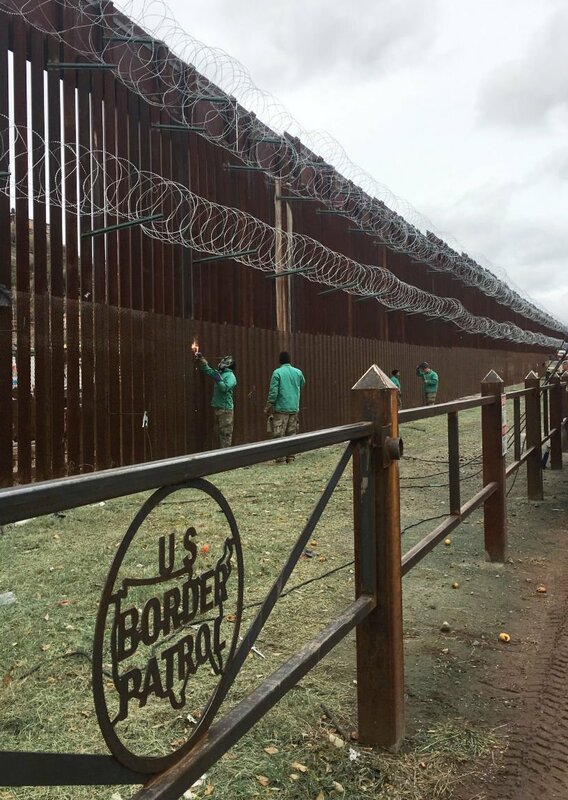 U.S. Army troops from Missouri were welding metal arms onto the border fence, arms that are set to hold more rolls of concertina wire than the three that already extend along the upper half of the fence there. Soon they will be near ground level. It gives deployed soldiers something to do. What was an absurdity that border residents shrugged off — concertina wire atop the fence — is starting to piss them off. The rolls of flesh-slicing wire are essentially at ground level on much of the east side of Nogales already, as will be the case soon along much of the west side of town soon. Nogales city ordinances, Garino noted, restrict where and how razor wire can be used — only around storage facilities and warehouses, and only at six feet or above. There’s an obvious reason for that: Accidentally stumbling into this wire can cause severe injuries. The proposed resolution asks the federal government to remove all the concertina wire soldiers have installed since December. To be clear, in some areas where the concertina wire has been attached to the fence at ground level, there are new, metal-rod fences that symbolically block off the areas of low concertina wire with warning signs that say “Danger, do not enter” in Spanish and English. But any child could duck easily through that fence, and a dog or cat could walk under its lowest bar. Up the hill east of downtown Nogales, there are no such protective fences. There are houses, then the border road, then the border fence, with six rolls of concertina wire on it as low as the ground. With President Trump’s newest deployment of troops to the U.S.-Mexico border, they now have a goal of adding 150 miles of concertina wire to the fence. This is, of course, something soldiers can do, though it has nothing to do with the only arguable crisis on the border — thousands of Central Americans either waiting at the ports of entry to claim asylum or turning themselves in to Border Patrol agents and then seeking asylum. The physical danger the wire poses is perhaps the residents’ primary concern right now, but just as bothersome to many people is the visual message. For the residents of this American border town, it’s as if they are being held in East Germany or North Korea. The wire, after all, is on the north side of the fence. It will keep people on the American side off the fence, sure, but that was never really a problem. “That’s doing too much,” said Art Abarca, a resident of Dunbar Drive, near West International Street. “That’s ridiculous,” his girlfriend, Jennie Flores, told me as they walked home from a shopping errand. They live in a neighborhood I visited in December, where the half-dozen people I interviewed at that time were resigned to whatever the federal government was going to do. Those I interviewed Tuesday were more unhappy. There’s the visual blight, the danger and the ridiculousness of it. Even after the first string of concertina wire went up on top of the fence, Abarca said, some people used a carpet to climb over the wire from the Mexican side of the border. “I think they’re just going to get a longer piece of carpet,” he said. Another of the complaints local merchants and residents have is that the wire makes downtown look like a war zone, and that could discourage shopping. Santa Cruz County Supervisor Bruce Bracker, whose family ran the recently closed Bracker’s store for generations, noted that they worked hard to get a grant that paid for the more attractive border wall that stands downtown. Now that’s ruined by the wire, he said. “We’re trying to make the downtown look nice. We’re trying to make the downtown a nice place to shop,” he said. The seven shoppers I interviewed on Morley Avenue on Tuesday weren’t particularly put off by the wire or soldiers, though. Aurora Gonzales, a 46-year-old from Nogales, Sonora, told me in Spanish, “It looks ugly. It’s too much wire.” But she added she plans to continue shopping north of the border twice a week. “It doesn’t affect me directly,” she said. East of Nogales, in the Kino Springs area, troops have put up concertina wire on the border fence within yards of where the fence stops at the Santa Cruz River floodplain. It makes no sense, because nobody would try to jump the border fence, with or without concertina wire, when they can walk 25 yards to the side and cross through a vehicle barrier — the only type of barrier that will stand when the river floods. But of course, every foot of installed wire helps meet the 150-mile goal. So Nogales and other border towns bear the burden of this nonsensical deployment of troops to address a crisis that is not happening there. Instead of writing angry letters, as Garino intends, they should consider simply following the soldiers with clippers and take it all down.